How Much Does Damaged Siding Cost To Repair? If your home's siding has incurred damage, you may be worried about how much you will have to spend on repairs. Problems always seem to arise at the worst times but knowing how much the project may cost, will help you budget for your siding repair needs. While the materials for most siding are strong and long-lasting, there will be an occasion that requires you to repair the siding on your home. Below are factors that will affect the cost of repairs. Prices can vary from as little as 100 dollars or depending on your specific situation, you can spend over 1,000 dollars. On average, you can expect to spend around 500 dollars for your siding repair needs. Understand that prices vary depending on materials and the extent of damage. Additionally, the estimate from your contractor may not include costs for disposal of old siding and trim, structural modifications or repairs also needed, and any work on soffit or fascia. Be sure to ask your insurance resoration contractor if these components are included and if not, how much they will add to the cost. Vinyl Siding: this type of material is a cost-effective option for your home. 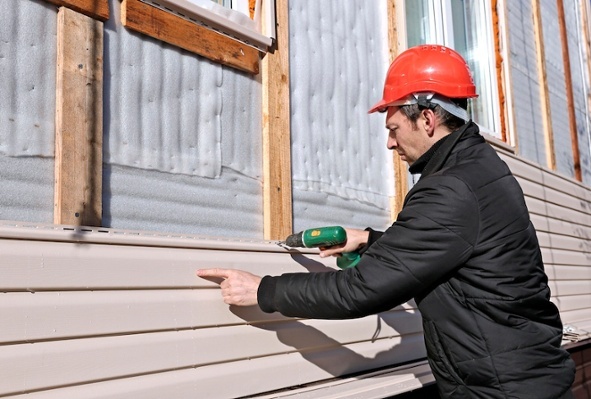 With easy maintenance and versatility, this siding is a popular choice for homeowners. Vinyl is strong and doesn't require a lot of repairs. However,with a strong enough storm, repairs may be necessary. Luckily, this material is typically easy to repair and is cheaper than other materials as well. Wood Siding: wood siding offers a unique look and is sturdy if maintained properly. However, wood needs constant maintenance to avoid several types of weather damage. Also, insects and rodents are attracted to wooden materials which may add the amount of repairs you need. Stucco Siding: This siding is very versatile and can be paired with other types of material such as stone. This type of siding can crack and tear over time which will lead to repairs needed. Aluminum Siding: is a low maintenance option but can easily be dented. Aluminum is more expensive not only to install, but to replace as well. If your aluminum is painted, it may be difficult to match the colors exactly. There are several types of material available for your home and each type differs in cost but the cost will also fluctuate depending on the color and style of your home's siding. If the damage to your siding requires a particular section to be replaced, more material will be needed. The challenge is finding the exact style and color to match the rest of the home exterior. Some homeowners have access to the leftover siding material when it was first installed but for the ones who do not, this can significantly raise the cost of repairs. According to Home Advisor, If the original siding is not available, it may be best to use panels from a less visible area of the home to repair damage in more visible spots. The panel that has been moved can then be replaced with the closest match available. Keep in mind, it may not match color perfectly, especially if your siding has been exposed to the elements for a few years. Of course, another component that affects the cost is the level of damage your siding has that requires repairs. For example, small holes and cracks can heighten the risk of leaks but depending on the size may just require the opening to be sealed or if larger, may require to replace a section of the siding. Some damages can be more work than expected like if you see a small rotted section and it turns out that almost the whole side has been affected. Try to expect the unexpected and set aside more than you thought the project may cost.